Organizations have lots of business relationships dictated by contracts and its terms. Keeping track of contract terms, provisions, obligations in a methodical fashion is frustratingly difficult when the volume of contracts is high. Developing systems and automating contract management is one of the top areas to improve productivity in contract management while managing organizational risk and compliance. Your company may own an inhouse document management system that is currently being used to manage contracts. It has solved the repository problem but does not provide means for starting workflows, receiving alerts or collaborating with third parties leaving you looking for a viable alternative. So how does one choose a contract management system? To answer that question, find below the top 10 features to look for in a contract management system. Multiple storage mediums for contracts leads to mixing of document versions, creation of duplicates and agonizing difficulty in finding contracts. In contrast, a centralized repository with contracts stored under individual business areas accompanied by metadata and third party information gives you a single source of truth and overall simpler contract management experience. Being wary of upcoming renewals, pending obligations and key provisions of your contract is a critical part of a contract management. A good contract management software assists you in these areas by sending you duly reminders on upcoming renewals and alerts on non-compliance occurrences and pending obligations. Contract managers lose weeks of time every year searching for contracts that are normally kept in local drives or repositories devoid of functional search. A full text and advanced search functionality provides the users an ability to narrow down contracts based on various natural parameters like contract title, author name, business division, etc. Executives having signing authority always have high priority tasks at hand. Sending the contracts for signature in the old fashioned way invites silos and creates delay in the execution of contract. Whereas, eSignature functionality provides a faster legal way to get stakeholders’ consent on contracts and documents and provides added benefits like security, verification and audit capabilities to the business. New contracts take weeks, if not months to reach execution after they are drafted. A contract management software expedites the contract creation process with standard contract types, clause library and template automation. It facilitates a smooth amendment process through document upload, amendment wizard and amendment specific workflows. Businesses that constantly work upon improving efficiency save countless hours in the long run. 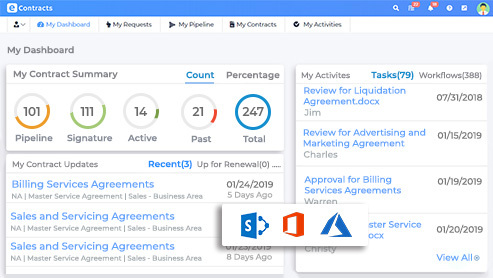 Performance reports on contracts gives contract managers and participants insights on their work patterns so they can identify bottlenecks in processes to eliminate them. Reports show you if your contracts are renewed on time, obligations are duly met and contract cycle times are proportionate. Without a custom designed software, contract creators would have to start afresh by checking latest guidelines and policies every time they create a contract. With this feature, a contract management system can automate the entire process by enabling users to define standard contract types and their associated metadata rules. The system helps businesses enforce governance while allowing for customization to individual business division rules and its contract types. Maintaining a standard clause library with commonly used clauses and their variations helps contract authors used standard language across the business’ contracts. When integrated with MS Office, users can add these clauses into their document with the click of a button. Template automation saves time by transferring key metadata and selected clauses into the mapped areas of documents. Sending contracts for approvals through emails is highly inefficient due to lack of transparency and document versioning issues. Software workflows, in contrast, provide a cleaner approval process by allowing users to select participants followed by the routing order. Notifications help you get instant updates on the process and while the workflow history comes handy during audits. Organizations that receive contracts created by third parties spend time checking the contracts’ compliance with their own standards. Contract Discovery tools use AI to find variance in the clauses of such contracts after ‘learning’ what standard clauses look like. These tools can auto-extract information from third party contracts to furnish metadata for your contract repository needs. Contract lifecycle management is an intricate process that requires attention to detail and a substantial understanding of the risks involved. A contract management software essentially breaks down the process into series of activities that can be controlled and improved upon. Organizations using contract management software stand a higher chance at mitigating contract related risks and maintaining healthy relationships with partners. Curious about the features Optimus BT’s Contract Management Solution offers? 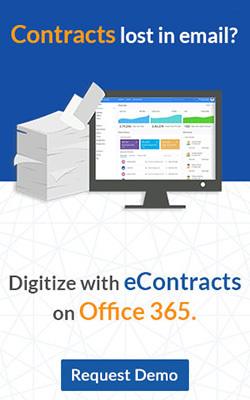 Head over to the eContracts Features page to learn more!